Arrhythmias are simply defined as any disorder of the normal heart rhythm, regardless of severity or clinical implications. The heart is a highly efficient, four chamber pump (see diagram below). The upper chambers are called the atria and the lower, pumping chambers are called the ventricles. The ventricles do the hard work of pumping the blood to the other parts of the body. The right-sided chambers receive oxygen-depleted blood returning from the body through the veins and pump this blood to the lungs, where it is replenished with oxygen. The blood then returns via the pulmonary (lung) veins to the left sided chambers, which then pump this oxygenated blood to the rest of the body. Normally each heart beat is triggered by a small electrical impulse that originates in a structure located in the top right chamber (right atrium) called the sinus node . These impulses travel rapidly throughout the atria triggering them to contract and help push blood into the ventricles. 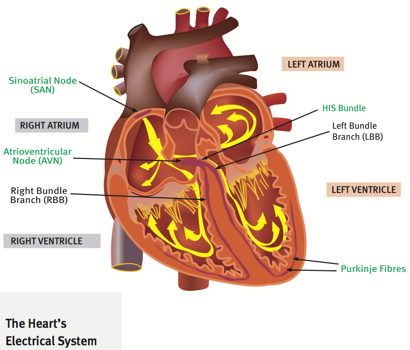 These same electrical impulses are then passed via a specialised electrical relay, called the atrioventricular (AV) node, to the ventricles, causing the ventricles to contract a short time later, after they have been filled with blood from the atria. The continuous firing of the sinus node creates the regular heart beat that can be felt as the pulse, heard with a stethoscope and recorded with an electrocardiograph – this is called Sinus Rhythm. The usual range of heart rates in sinus rhythm at rest is 60 – 80 beats per minute (bpm). During exercise, the firing rate of the sinus node increases progressively. When the sinus rate exceeds 99 bpm the rhythm is called Sinus Tachycardia . Maximum heart rates in sinus tachycardia vary between individuals, largely dependent on age, but are influenced by other factors including level of fitness. When the sinus rate is below 60 bpm the rhythm is termed Sinus Bradycardia. Sinus bradycardia at rates down to 40 bpm may be normal in some people, particularly those who are very fit, however very low heart rates are usually abnormal and cause symptoms. There are many forms of arrhythmia and many are associated with an awareness of the disordered heartbeat – this is called palpitations. Arrhythmias may cause the heart to beat too fast, too slow, or irregularly. Apart from palpitations, arrhythmias may be associated with other symptoms that include fainting, dizziness, shortness of breath, chest discomfort, fatigue and reduced exercise capacity. What is Cardiac Rhythm Management? Cardiac Rhythm Management (CRM) is a subspecialty within Cardiology that deals with disorders of the heart rhythm (arrhythmias). The aim of Cardiac Rhythm Management is to accurately diagnose and effectively treat arrhythmias that cause disability due to their associated symptoms or potential risks to the patient’s health. CRM services include a complete range of non-invasive and invasive diagnostic investigations, from ECG and Holter Monitoring to Electrophysiology Studies, and all levels of management of cardiac rhythm disorders, from consultation and drug therapy to device implantation and catheter ablation. CRM services are provided by three Cardiologists with subspecialty expertise in Electrophysiology and Pacing and highly trained and experienced Cardiac Technologists. Diagnostic equipment is ‘state-of-the-art’ and regularly updated. Melbourne Heart Care strives to provide world’s best practice, evidence-based management of all forms of cardiac rhythm disorder in adults and children. Childhood arrhythmias are managed in partnership with Monash Heart CRM Service and the Arrhythmia Service of Royal Children’s Hospital, Melbourne. Do I need CRM services? If you have a heart rhythm disorder that is causing troubling symptoms or is suspected of placing your health at risk you may need Cardiac Rhythm Management Services. The request for these services is made by your treating physician (GP, cardiologist, etc) based on their assessment of your problem.